A butterfly house is any one of several types of shelters for butterflies. There are large butterfly exhibits in botanic gardens and conservatories, butterfly houses that can be made to observe a butterfly for a few days before releasing it, and butterfly shelters that give butterflies a safe place to roost. Most areas of the country have places where you can go to observe many different species of butterflies. This educational family field trip is a great way to learn about butterfly behavior and see butterflies that may not be native to your area. Walking through a tropical garden filled with colorful butterflies and beautiful plants is a relaxing way to spend an afternoon. You can observe butterflies close up as they fly freely around you, feeding on the flowers and fruits in the exhibit. There may be special areas where butterflies can be observed emerging from cocoons. Butterfly shelters are an easy project to make. They are a great addition to your butterfly garden. Most kids can make them with some help and you can buy kits or ready-made houses.These houses are generally made of wood with slits in it for the butterflies to roost in. This gives them a protected place to wait out a storm, hide from predators, or rest for the night. Do not use pressure treated lumber as it has a chemical in it that is deadly to butterflies. For the same reason do not paint the inside of the house. It is fine to decorate the outside however you wish. 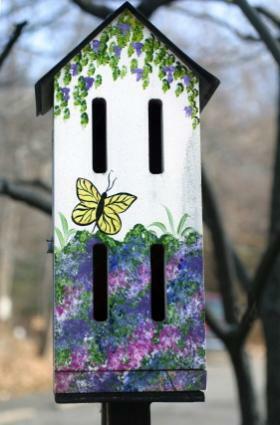 Place your butterfly house on a three-foot pole in the midst of the flowers in your garden. It should be protected from wind. Having a food source, like a sponge soaked in uncolored hummingbird nectar, will also draw butterflies to your house. Give the butterflies a source of fresh water to take care of all their needs. Always use a net to catch the butterfly. Never touch the creature's wings. Provide food and water while it is in captivity. Release it where you found it. Do not keep it for more than a day or two. A butterfly shelter can be easily made by following the directions that are given at Butterfly School. This website is full of useful information about butterflies for adults and children, and has many free resources for teachers. As more land is turned into roads, housing developments and malls, butterflies are losing habitat. Some butterflies are becoming endangered and a few are all ready extinct. By creating areas where they can live and thrive you can help to protect these fascinating creatures.